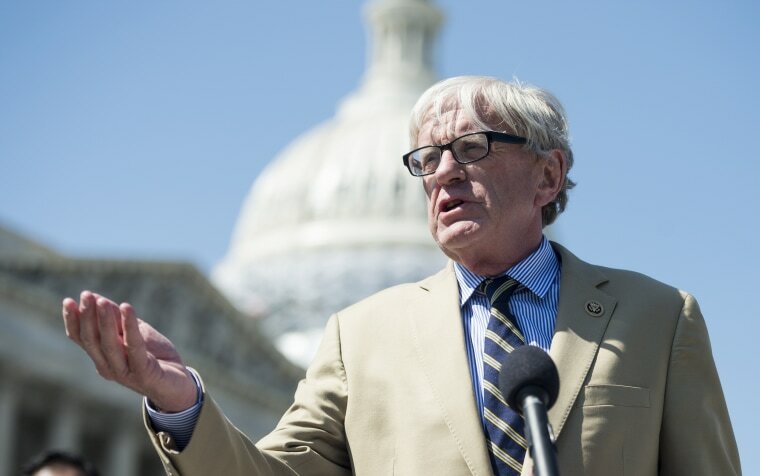 Rep. Brad Ashford, D-Neb., speaks during the House Democrats' news conference to discuss the post-9/11 GI bill at the Capitol on April 14, 2016.Bill Clark / CQ-Roll Call,Inc. WASHINGTON — In their battle for control of the House, Democrats have caught some important breaks over the past few months. Pennsylvania’s new congressional map. The narrow win in PA-18. And key GOP retirements, including Paul Ryan’s. But over the next month, Dems — and the Democratic Congressional Campaign Committee, specifically — face at least five primary hurdles they need to clear. And if they trip on most (or all) of them, those failures will erase the potential gains they received from Pennsylvania’s new map, hurting their chances to win back the House. Three of the five hurdles are in California, where the state’s “Top 2” primary system could shut out Dems from the general election in districts Hillary Clinton carried in 2016. CA-39 (June 5 primary): In the race to succeed retiring Rep. Ed Royce, R-Calif., the conventional wisdom is that Republican Young Kim is assured of being in the Top 2, but the race for the other slot is a margin of error contest between Dem Gil Cisneros (whom the DCCC prefers), Republican Bob Huff and Dem Andy Thorburn. The DCCC is airing negative TV ads against Huff and another Republican, Shawn Nelson. The Cook Political Report currently lists CA-39 as LEAN D.
CA-48 (June 5 primary): Rep. Dana Rohrabacher, R-Calif., is potentially vulnerable, but Democrats are sweating making the Top 2 after former Orange County GOP Chair Scott Baugh got into the race in a district where Republican primary voters still outnumber Democrats. The top Democrats are Hans Keirstead and Harley Rouda. And the Los Angeles Times reports that the DCCC just named Rouda to its “Red to Blue” program. Cook has CA-48 as TOSS UP. CA-49 (June 5th primary): This is the race to replace retiring Rep. Darrell Issa, R-Calif., and the top Democrats are Doug Applegate and Sara Jacobs; Dems feel good about Applegate’s chances to make the Top 2, and there’s a chance two Democrats could qualify for the general. The top Republicans are Diane Harkey and Rocky Chavez. Cook has CA-49 as LEAN D.
NE-2 (May 15): In the race to take on Rep. Don Bacon, R-Neb., Democrats have a primary between former Congressman Brad Ashford (who narrowly lost to Bacon in 2016) and Kara Eastman, who’s backed by progressive groups. Dems don’t believe Ashford will have a problem beating Eastman, but it’s a race worth watching. Cook has NE-2 as TOSS UP. TX-7 (May 22): Earlier this year, the DCCC received plenty of criticism for dropping oppo on one of their own candidates — Laura Moser — because the committee thinks it disqualifies her as a general election candidate against incumbent Rep. John Culberson, R-Texas. Moser still advanced to the run-off against Lizzie Fletcher, but national Democrats have warned they won’t play in this expensive Houston district that Hillary Clinton won in 2016 if Moser is the nominee. The CW, however, is that Fletcher has a slight lead for the runoff. Cook has TX-7 as TOSS UP. Bottom line: Democrats will consider it a success if they clear at least four of these five hurdles; it will be manageable (but not ideal) for them if they clear three; and it will be a near-disaster if they clear only two or fewer. So the next month of primaries — especially the ones in California — will be crucial for Democrats in their quest to take back the House. In case you missed them, here are some of the recent midterm developments we’ve chronicled on our Rundown blog: The 2018 generic ballot has been steadier than you think… Also: Independent voters are close to outnumbering Republicans in California… And Trump, in Indiana last night, stayed on message — and gave Joe Donnelly a new nickname.